Now that the final day is here in all its fresh glory, I can say that May had me SWAMPED. Between two writing-related trips, an exciting project, family visits, family illness and a break-neck pace at the day job, it was absolutely off-the-wall bonkers in Sarah’s world. BONKERS. I feel like I’ve barely had time to breathe, let alone process all that has gone on, but what I can say I noticed is something I totally didn’t expect. I wanted to write ALL THE TIME. Somehow, some way, I noticed in the last thirty-one days that my level of creativity seemed to go up with my level of busyness in any given day. Obviously, this wasn’t a scientific survey or anything, but on recent twelve-hour work days, you’d find me tapping away at my phone with any free second. I wrote them while exercising, driving (typing them after I parked!) and while up with the baby in the middle of the night. And when I wasn’t actually writing, I was taking mental notes. Or actual notes. Or running through dialogue in my head. Of course, I wouldn’t do that during a three-hour work meeting, but I might during breaks. Looking at it all, I wrote more than 35,000 words in the month of May. Words I actually like and are good—I know because I revised them as I went (ah, the power of rereading what you wrote yesterday before starting again today). I’m not sure what June will hold. Maybe I burnt myself out with work, writing and life in May and will spend the next six months getting my equilibrium back. Or maybe stress didn’t have anything to do with it—I DO love the project I’m working on. Maybe those words would’ve flowed out of me anyway. It’s impossible to tell. What I do know is that stress can be surprising in the most productive of ways. Not that I want the month of May back. Nope, nope, I don’t want that. Where have you found unexpected creativity? Today is May 30 – traditional Memorial Day in the US and the traditional start of my childhood summer. And, oh yes, you may feel free to wear white again. Like most children of my era, I grew up in many places. There was my great-grandfather’s farm in upstate New York. Then there was my cousins’ house in Dade County Florida. Then there was the place I usually went to school. That was northeast New Jersey. School started the first Tuesday after Labor Day and because of snow days and such, ended sometime around mid-June. That was the official school year. The unofficial school year ended the same day summer began in my world – MEMORIAL DAY! Everything that made life worth living began on Memorial Day. The beaches (we called ‘em the shore) officially opened. Families celebrated the holiday (or the weekend after the holiday depending, Memorial Day wasn’t always on Monday back then) by driving ‘down the shore’ and opening up the summer houses. That was the big deal for the folks. 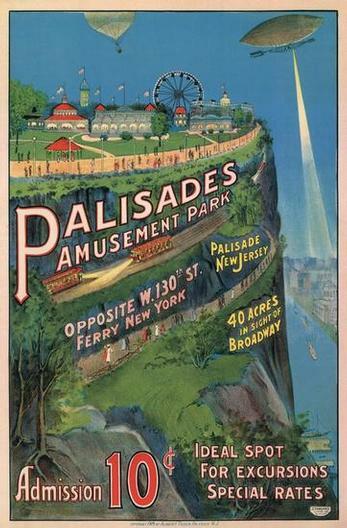 For the kids, well, the amusement parks officially opened. Now that was something to look forward to. 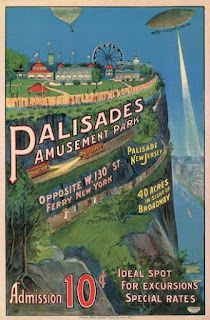 Parents wouldn’t usually take us down the shore (except for the annual house opening and airing) but they would take us to Palisades Park on a Saturday before school ended, or Freedomland, and sometimes could be persuaded to take us to Jones Beach, but that was on Long Island (pronounced Lawn Guyland) and a drive. Palisades was the big prize. Best of all, it was only a half hour from my house. In my earliest memories, my Dad took me. He would pay our admission ($0.10 I think) and we would walk through the magical gates. First stop was the ride ticket seller. I don’t know how much a day’s worth of tickets was, but it was quite a fistful and I never remember going back for more. Then it was to the outdoor arcade to win prizes and visit with my Dad’s friend Fortunato. Then it was time for lunch – usually a big Italian sausage with lots of onions and peppers – and finally, the rides. Years later, I asked my Dad about this unusual sequence. He told me he had no stomach for the rides, so he had the excuse of carrying all my arcade prizes around. I loved anything that went fast or turned me upside down. My Dad turned green at the thought. Once my brother was old enough to drive it was his job to take me. That meant a different sequence. No more arcade. Now it was straight to the pool. My brother had his priorities, and meeting women topped his list. After the pool, if my brother met someone, he’d hand me a fist full of tickets and off I would go, alone with orders to meet at the gate at 5 PM. I headed first for these little space ships where I was strapped in and they spun in in clockwise and counter-clockwise circles while the capsules spun around counterpoint. Then the Round Up, and the Tilt-A-Whirl, and the Cyclone. The world’s biggest wooden coaster. OK, that’s not true, but I believed it at the time. I never did lose my love of defying gravity! I was too young to appreciate the music, but I do remember hearing Paul Anka. I was stuck on the top of the Ferris Wheel. For his entire concert. Freedomland was the other amusement park. It only lasted a few years before it became Co-op City. 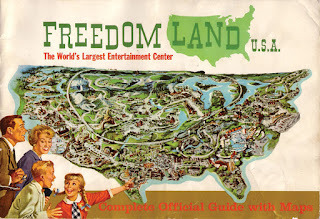 I have since learned that Freedomland was in the shape of the United States. I have no idea, but I do remember witnessing the Chicago Fire, wild west shootouts (once I was taken hostage on a runaway stagecoach) and riding paddlewheel steamboats on the Great Lakes (“Do you know what lake you’re on? Lake Huron!”). I also have one other indelible memory of Freedomland. It’s where I took my first helicopter ride. We were only supposed to go around the park, but it was sunset and glorious and the pilot took us out over New York City so we could see the sights as night fell. These places are long gone. Disney Parks and other amusement parks have sprung up to take their place. Somehow though the showcases and vignettes of those parks seem pale to me. Totally incapable of inducing the adrenaline charge that went with putting yourself under physical stress, or the imaginative charge of witnessing and participating in historical events. Oh, that thing about wearing white? Well, it was only appropriate between Memorial Day and Labor Day – so, wear something white today. What about you? What is your favorite childhood action memory? I recently heard on the news that a family has been accused of using funds raised by charities as their personal piggy banks. It is alleged that The Cancer Fund of America, The Breast Cancer Society and Children’s Fund of America gave an estimated 3% of public donations to people with cancer. In the interest of full disclosure, I have given money to these “charities.” The people involved are, of course, innocent until proven guilty, except for those family members who have admitted their guilt as part of their plea agreements. Some years ago I was persuaded to stop contributing to those charities after I read a report that the charities were under investigation. I learned of that report from a group called Charity Navigator. They describe themselves as America’s leading independent charity evaluator. 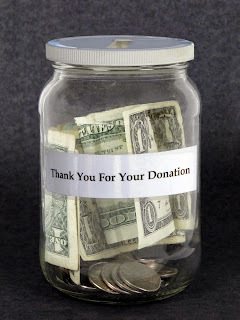 The organization evaluates public charities granted tax-exempt status by the IRS. That excludes many religious organizations like the Salvation Army and private foundations like the Bill & Melinda Gates Foundation. The organization limits itself to charities with more than $500,000 annually raised by donations and total revenues greater than $1,000,000 for one year. That still covers most major charities. The evaluation they conduct is based on three factors: Financial Health, Accountability and Transparency, and Results Reporting. Details about each category are available on the site. No charitable organization is charged for a rating. The organization depends entirely on private donations. In the interest of full disclosure, I have donated to them. I find their ratings helpful and interesting. You can request results on an individual charity or investigate an area of focus like protecting the environment or providing day care in Cincinnati. Charity Navigator provides ways to respond to crises around the world. My sister, Tina, told me about the organization. Like most people, I don’t have the time or expertise to evaluate charities. The watchdog organizations have been stretched to the breaking points and, even if fully staffed and funded, they could never keep up with all the varieties of human greed. I find Charity Navigator helpful. You might try it too. Maggie in my side yard last winter. Here in Northeast Ohio, and indeed much of the country in January, the weather was horrible – bitter cold and lots of snow. But I didn’t mind too much because that is the time of the year when I like to hibernate and get more reading and writing done. I love getting comfortable in my nesting chair with a good book, and also have more time to write. February was equally a bitter cold month with more snow falling. That’s when I started looking forward to spring, but I figured it was coming soon. Maybe March would even come in like a lamb as it has done sometimes in the past. It didn’t. By then I was really getting sick and tired of winter; hauling buckets of water from the house to the barn for my ponies and old hens because the outside pump had frozen. Oh, how I wished spring would come. I longed to walk in the woods mornings again, but couldn’t not only because of the extreme cold, but the depth of the snow. Finally, on March 30th, I was able to walk in the woods wearing boots, of course, and the water pump thawed so I didn’t have to carry water buckets from the house. 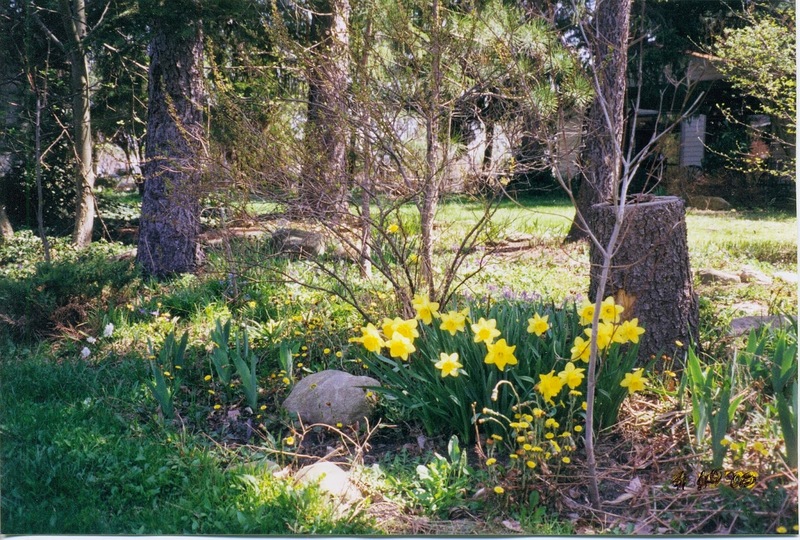 Daffodils in my back yard in April. April was warmer; however with April we got those April showers that bring May flowers. For all of April I wore barn boots and squished and sloshed on much of my path through the woods. My driveway had puddles and the lawn was squishy with puddles, too. Later the daffodils started to bloom as well as some of the earlier flowers in the woods, and I was happy spring was finally here in spite of the sloppy squishy ground. Phoebe hasn't quite lost all her winter coat yet. That is I was happy it was here until after I came home from Malice in early May. You see, I wasn’t the only living thing that met spring with exuberance. New flowers kept appearing, and that made me happy, but not the weeds that grew faster and thicker than my flowers. And then there was the grass. I no sooner mowed one section, then four or five days later, I had to mow again. I don’t really mind the dandelions, I love the little suns blooming everywhere, but the grass around them kept getting higher and higher. Now I don’t have a riding lawn mower, I have a self-propelled old mower that I still have to let go of the self-propelled lever to pull back on the mower and maneuver it through different areas. When I’m mowing areas with really high grass, my mower clogs up and quits, so I have to turn it over and clean out the grass stuck under there. Once it has dried a day or two later I rake the cut grass for my ponies. And apparently on the tree telegraph line, my few white ash trees have heard the Emerald Ash Borer is on its way, so they have liberally sown seeds through every one of my gardens so saplings are growing everywhere some waist high or more. Of course, there are also the branches that came down in the winter to clean up as well as dead branches hanging low on trees that I tend to run into when I’m mowing and not paying attention. Flowers, rose bushes, etc. in front of pots and weeding buckets. In an early burst of exuberance on my part, when my two sisters and I went to Bluestone Perennials the week before Malice, I bought a lot of plants. Unfortunately many of them are still in the flats I brought home. Over the past few weeks I bought more flowers, a few herbs and vegetables, four rose bushes and a Japanese maple – almost none have been planted yet except for one window box and three planters I took to the cemetery for the graves I decorate. Hard to believe that most of this was full of veggies last year. Why haven’t I planted them yet? Well, the fenced in vegetable garden with raised beds is full of weeds – big healthy weeds. I did get a small part of it weeded and planted, and part of my strawberry patch is weeded, but the rest of it is a horror, and I don’t use weed killer. Even the brick sidewalks – darn Thomas Jefferson’s Monticello that gave me the idea that brick walks would be nice. Ever try weeding brick walks? Every flower garden in my extensive gardens is filled with weeds, even the ones I had so nicely weeded last year. The problem with Pollyanna exuberance, which I’m deeply afflicted with, we tend to overlook the negative side of things. At least we do until it’s staring us in the face. My gardens would actually be quite lovely if I didn’t have to spend a part of most days mowing and even more so if I could afford several – make that three, or more gardeners. My little goldfish pool still needs cleaned, too. But alas and alack, I can’t. The only thing for me is to keep working at it a little at a time. It is such a pleasure to look at a weeded and neat looking garden area when I finish it. Unfortunately, those evil little weeds tend to sneak in during the night and take over again. Since I can’t fight them, I’ve decided to put on my Pollyanna mantle and declare my gardens are wild flower gardens. And you know what? I’ve found that except for dedicated gardeners – especially the neatniks, most people think my gardens are lovely. It’s all a point of view, after all. Yeah, twelve yards under that. A kid is coming to shovel it in. One more thing I wished for that came to pass last week. I wanted to find someone who would deliver sawdust for my pony stalls so I’d no longer have to buy bales of pine chips from Tractor Supply. My Amish blacksmith gave me the name of a man, and a week ago he delivered twelve yards of sawdust. Now all I have to do is find someone who will move it a wheelbarrow at a time into a stall I have ready in the barn to store it. 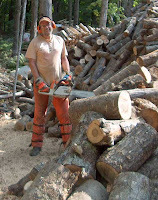 Do you have any idea how big a pile of twelve yards of sawdust is? Several of many rhododendrons I have blooming at my place. I’ll admit when I drive through neighborhoods with neat lawns and gardens with everything trimmed and looking perfect, I feel a moment of wistfulness, but it doesn’t last long. Last week I visited a friend with the most awesome hosta gardens and other plants, too. I mean, I swear there was not a weed hiding anywhere. Of course, she and her husband spend hours and hours to make them look so perfect. As for me, I’ve always loved walking through fields and woods where nothing is trimmed neatly. I’m more in tune with what is natural, and even though that may have a bit of making excuses for the state of my gardens, in truth, I have so many other interests that I don’t want to spend all my time working in my gardens. However, I’m still wishing for a gardener who works for free. What have you wished for that wasn’t exactly what you wanted? “You’re the one,” he repeated, still holding her close to him. From page one, I was morbidly fascinated by Alan Cupp’s Scheduled To Die. I’m not one to stop and gawk at auto accidents, but the situation Alan presented glued me to the page and harnessed my sympathy for victim, Dana Carrington, a nice, but too trusting woman. While on a business trip to Asheville, NC, she happens on a handsome stranger, who is a psychopath. I’m confused Alan. 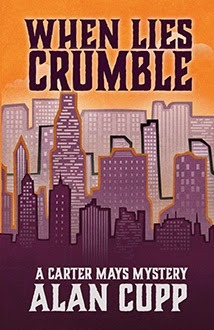 On Amazon the first book in your Carter Mays mystery series is titled, Malicious Masquerade, but from the book description on Henery Press’s website, the same book is titled, When Lies Crumble. Is there a reason the same book has two titles? Cupp: When I wrote the first one, I wrote it as a stand-alone novel. 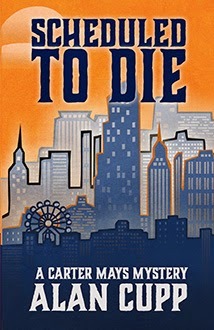 However, my publisher really encouraged me to consider making Carter Mays a series. So when I came up with a story line I really liked and felt would work with Carter, I wrote the second one, Scheduled To Die. At that point, my publisher decided to design covers for both books that better captured the feel of urban crime mysteries. In the process, we decided to re-brand the first one changing the title to When Lies Crumble. I personally feel like the changes coordinate the two books together and serve as a better reflection of the stories. Scheduled To Die begins when Dana Carrington trusts the wrong man, who has misrepresented himself by lying to her. Later in the book, we discover Betty, Dana’s mother, is too trusting and gives out more information to Mike Sweeney, the psychopath. Do you think most people are too trusting? Is it a learned behavior? Cupp: To some extent, I think so. I think the environment we grow up in has a big influence. If someone lives in fairly peaceful surroundings and has managed to live a life without much adversity, it can make that person less guarded and more trusting. I also recently heard on the radio about a study that reveled older people (senior citizens) are often more trusting and willing to give everyone the benefit of the doubt, making them more susceptible to being victimized. I tend to believe it depends heavily on an individual’s life experience. Mike Sweeney is very smart. Are all psychopaths smart? Although he is your creation, how much did you research psychopaths? Cupp: I doubt all psychopaths are smart. However, the ones that are smart are the most dangerous. I didn’t really do much in the way of researching psychopaths. I relied more on my personal perspective of what would make an individual extremely frightening. The terrifying aspect of this book is how real the situation could be. 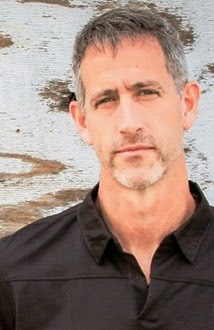 When Mike drugs Dana in her hotel room, he copies her keys, gets her address, phone numbers, goes through her computer, and finds out her life details making her vulnerable. Because Mike knows so much, he has power over Dana—Is power and control the motivation behind psychopathic behavior? Cupp: I believe power and control can be the motivation behind it. But I also believe it can be the result of someone’s own miserable, tortured existence. Perhaps they’ve been on the receiving end and are desperate to switch their role and not be the one in pain. Erin Naylor, Dana’s best friend, urges her to be proactive and go to the police. But after Dana sees Mike following her in a car and freaks her out and she crashes, Dana decides to hire Carter Mays, who Erin knows from her gym. What is Carter’s first reaction and strategy after hearing Dana’s situation? Cupp: Carter immediately feels compassion for Dana and is compelled to help her. His initial strategy is to keep her safe from immediate danger while he gains as much information as possible so he can eliminate the threat all together. Many of our readers like cozies. Your book is not cozy. Mike kills Dana’s dog. For that reason alone, many of our readers would kill Mike. Was that the intended effect? Cupp: My book is definitely not a cozy. It’s much more of a hard-boiled. Throughout the book, I want the readers to feel the intensely horrifying nature of this man and what Dana is experiencing. Whether it’s the subtle calm manner in which Mike speaks of Dana’s death to his more dramatic destructive behaviors, both Dana and the readers should understand the nature of this man. When Dana is able to grasp the potential for evil this man has, it better equips her to fight for her own survival. All villains have a fault. Mike’s is his ego. In his need for power and superiority over others, he reveals enough of himself for Carter to mount an offense. Is it strategic warfare? Cupp: I believe Mike is so confident in his ability to elude anyone pursuing him, he’s willing to make a game out of it. When I looked at your books on Amazon, it appears that you started your writing career in mystery, then changed your focus audience to YA, and then came back to mystery. What’s the story? Were you published by small press? 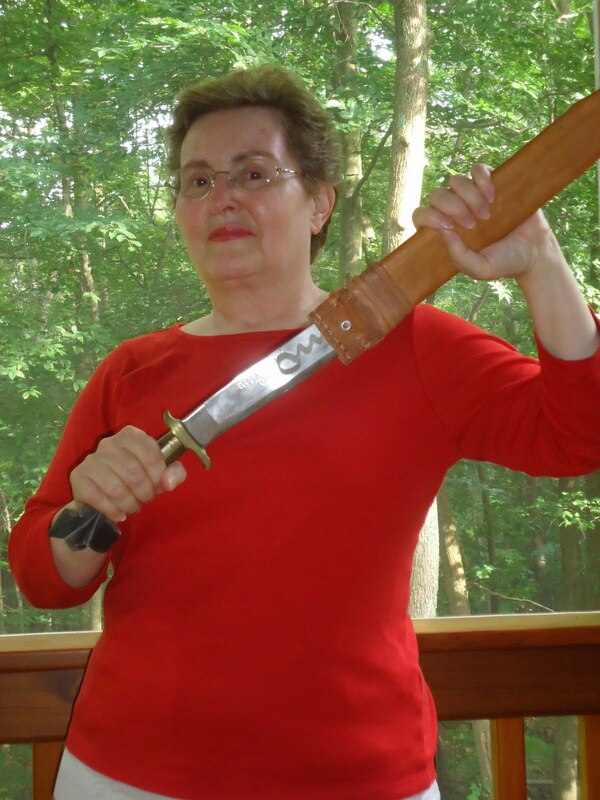 Cupp: I typically don’t really have a particular genre in mind when entertaining a story idea. When that initial scenario comes to my mind I go with it. It’s usually sometime later when I start realizing, “Hey, this would be a great YA book or a great suspense novel.” I enjoy writing a variety of stories. I like writing humor as well, although I’ve not published in that genre…yet. I am published by smaller independent publishers. 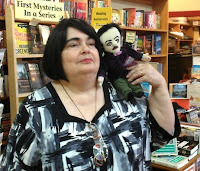 With my Carter Mays mysteries, it’s Henery Press, who specialize in mysteries, particularly cozies and humorous. 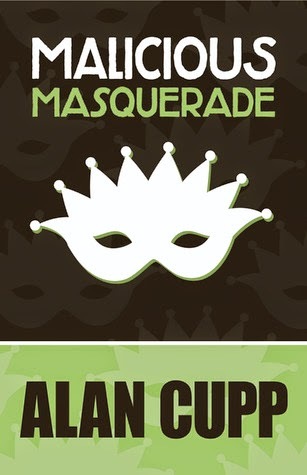 Who is Alan Cupp when he’s not writing? Cupp: Aside from writing, it’s my faith and family that best define me. I’m married to my beautiful wife of nearly 23 years. And I am the extremely proud father of two exceptional young men, one in college and one in high school. Finally, I’m pretty much a big kid who enjoys staying active. You can often find me trying my best to keep up with people much younger than me on a volleyball court, softball field, or playing ultimate Frisbee. What attracted you to submit to Henery Press? Cupp: As a fairly new publisher, they were very approachable from the beginning and committed to putting out quality books. With the tremendous growth and success they’ve experienced in the last few years, I feel blessed to be associated with them. They’ve been great to work with. Chose a vacation, Alan. Beach or mountains? Cupp: Both! Vacation has always been a priority to our family. We do tend to end up at the beach most often. Scheduled To Die will be released by Henery Press in June. Be sure to put this mystery thriller on your TBR pile. Connect with Alan on Facebook. Would you rather read a mystery with a surprise ending or one with a predictable outcome? However, people with high self-esteem enjoy reading mysteries that end with an unexpected twist. How did researchers arrive at that conclusion? First, participants (84 German college students) were given a variety of personality and psychological assessments. Then, they read a one page short story in German about a businessman who was stabbed while in his villa titled “Murder Because of Lust or Greed?” with two likely suspects—the victim's wife and his mistress. 1) Both suspects were equally likely to have committed the crime. After reading one of three versions of the story, participants rated how much they enjoyed the resolution. People whose personality assessments suggested that they had low self-esteem preferred the confirmation ending over the surprise ending. Participants who had high self-esteem scores chose the story with the surprise ending. Both groups liked the story in which it was unclear whodunit until the end. 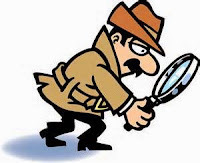 · Situational factors may influence enjoyment of reading mysteries. For instance, if a reader has a bad day and her self-esteem is down, she might prefer a predictable resolution to a story. · People who get easily bored are more likely to enjoy a story with an uncertain outcome. Why conduct this study? Knobloch-Westerwick said that researchers know little about what makes crime fiction popular or appealing to readers. So, they attempted to find out how the mystery genre interests different kinds of people. 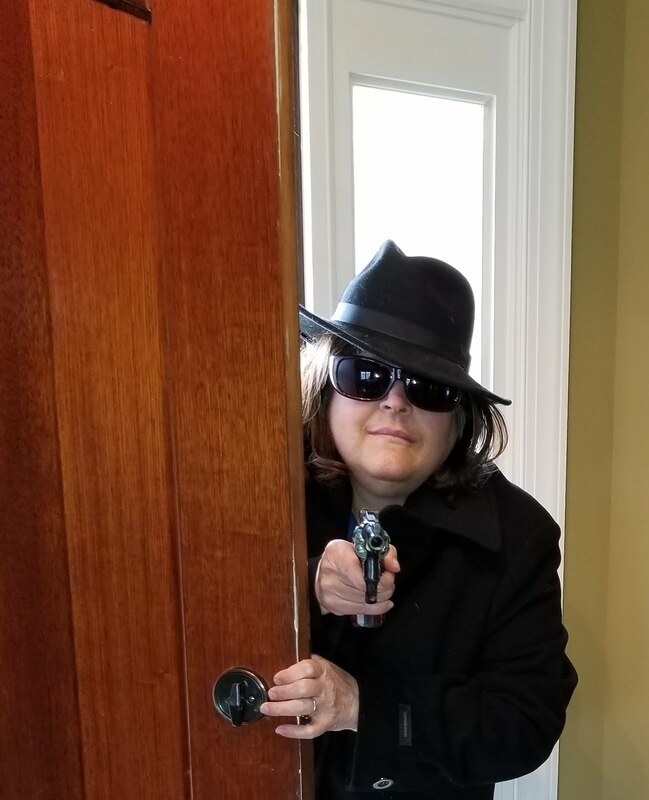 She also pointed out that mysteries are complex with multiple suspects and motives compared to suspense stories that have a good guy vs. a bad guy. Overall, mysteries probably appeal to people who enjoy thinking more than the average person. Do you believe that little is known about what makes crime fiction appealing to readers? Do you think that readers who enjoy mysteries are deep thinkers? 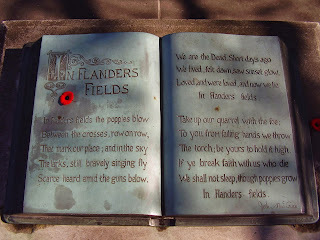 Poppies symbolize remembrance throughout the world. Last year, thousands stood in silent contemplation of the controversial Blood Swept Lands and Seas of Red art installation at Windsor Castle. 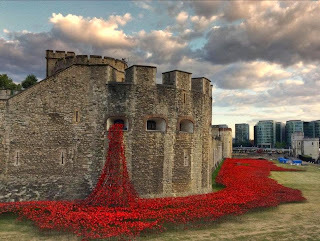 A ceramic poppy symbolizing each of the 888,248 war dead of the United Kingdom in World War I ringed the castle in crimson. How did the poppy become a symbol of remembrance? It all started with a poem and a teacher from Georgia. Moina Belle Michael grew up on a plantation. At fifteen, Moina (pronounced Mow-EE-na) started teaching in her rural town’s school, and when years of bad weather ruined crops and bankrupted her family, her teaching paid the bills. 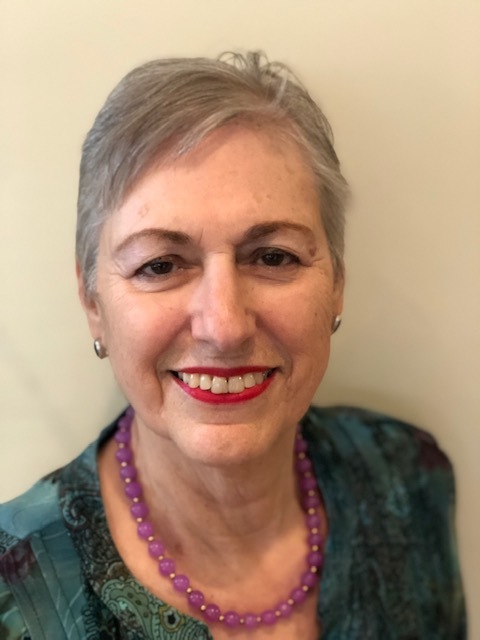 Eventually the family got back on its feet and Moina continued teaching, becoming over thirty years an admired educator and influential professor at the University of Georgia. When World War I began, Moina was in Germany, halfway through a European tour. As she wrote in her autobiography The Miracle Flower, “the very foundations of our world were shaken by a radical student who threw a bomb into the carriage of an Austrian archduke.” Moina’s group returned to the US on the RMS Carpathia, the ship that had rescued survivors of the Titanic two years earlier. Moina returned to Georgia, where she resumed teaching at the University of Georgia. But she ached to do something to help the war effort. After a two-year search, Moina took the only position open to her as a 47-year-old woman with no medical training: working for the YMCA Overseas War Secretaries organization in New York City. While working at a conference, Moina read Canadian Lt. 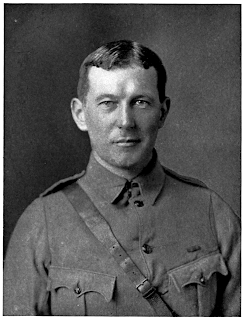 Colonel John McCrae’s poem “In Flanders Fields” in The Ladies’ Home Journal. McCrae, a Canadian surgeon, had written the poem after performing a burial service for one of his students killed in action. Scarlet poppies, one of the few flowers to thrive in disturbed earth, ringed the battleground. At the same YMCA conference, Anna Guerin saw Moina’s poppy pin and brought the idea to France. After the war, Guerin sent poppy sellers to England to sell paper poppies to raise money for French war orphans. 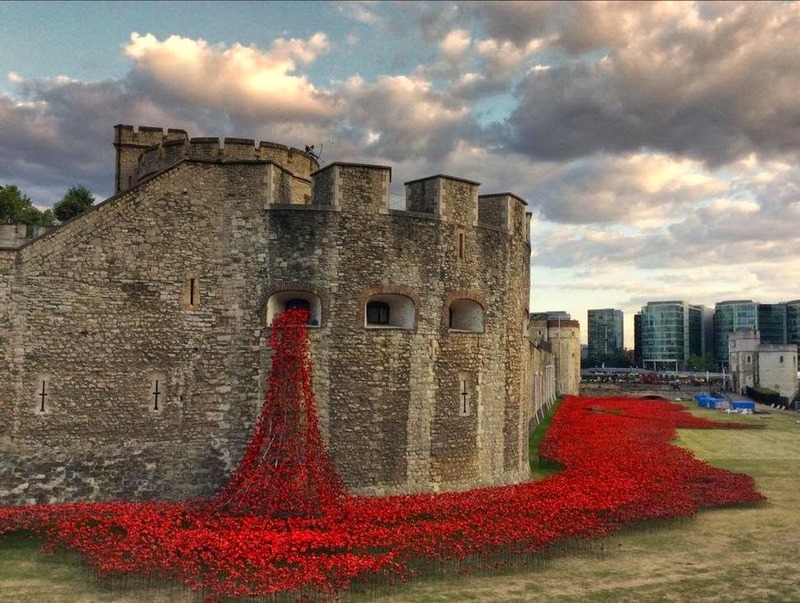 The poppy-as-remembrance idea spread across Great Britain. 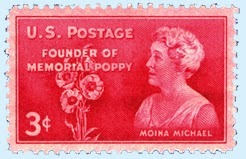 Moina’s poppy was the small seed that flowered years later into the acclaimed Windsor Castle art installation. 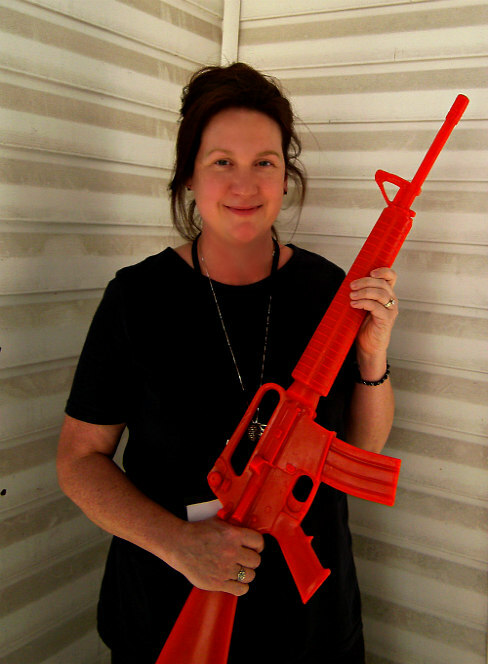 In the United States, Moina’s project struggled to gain traction until several veterans’ organizations, chiefly the American Legion and the Veterans of Foreign Wars, adopted the idea. Now, millions of small paper poppies are distributed each year. Almost one hundred years after the United States entered World War I, Moina’s poppy remains a small but poetic tribute to the fallen. Moina believed that the poppy symbol transcended mere sentimentality, and by the simple gesture of wearing one she would honor the memory of the soldiers lost. Is This a Golden Age of Crime Fiction?